CG Vyapam Recruitment 2017 Released. Chhattisgarh Krishi Vistar Adhikari Vacancy Notification Updated. CGPEB Exam updates regarding Apply Online, Last Date to Apply and Exam pattern. Chhattisgarh Professional Examination Board By Chhattisgarh CG Vyapam Krishi Vistar Adhikari Notification 2017 Has been released. Check all Exam Updates for Assistant Engineer, Chemist, Steno & Assistant, Bhoo Mapak TJS, Investigator, Sahayak Samparikshak, Data Entry Operator – DEO, Labour Inspector, Sub Engineer, RAEO And Other Various Posts. Professional examination board of Chhattisgarh has recently invited applications for the posts of Rural Agricultural Extension Officer and surveyors posts from the eligible candidates by publishing an official notification.The board in its official notification indicated that they are planning to recruit 773 candidates who meet the mentioned eligibility criteria.T he job seekers who have been looking for an opportunity in government sector can utilise the opportunity for there welfare for this they have to visit the CG Vyapam Recruitment 2017 to critically examine and read the recruitment notification.Interested applicants can download the application form from the official website of CG Vyapam cgvyapam.choice.gov.in. The aspirants are suggested to fill the online application and upload the supporting documents which are required by CG Garmin Krishi Vistar Adhikari notification for all the relevant information. Online application form had commenced from 2nd march and the last date for the online registration form for the recruitment process is 20th march.The form submitted after the last date will not be accepted on any grounds Selection Process for CGPEB Regional Agriculture Extension Officer Surveyor Jobs. The candidates will be recruited through the written recruitment test.The Candidates who will qualify will be considered eligible. The aspirants who have the mentioned Qualification can apply for the posts. The desired Qualification is as follows: The applicants must have completed 12th. ITI in surveyor trade. Bachelor’s degree agriculture from a recognised university/Institute. The age criteria as prescribed by the recruiting authority is that. The candidates must have attained the age of 21years and the maximum age should not exceed More than 30 years..The application fee has to be paid by the candidates after they have successfully submitted the online application form. Pay scale of CG Vyapam 773 agriculture officer surveyor vacancies 2017.The aspirants will get the remuneration of Rs 5200-20,200 with the grade pay of 2800.T he candidates will get all the other perks and benefits available for the person’s recruited under the CG Vyapam Gramin krishi Vistar adhikari and the surveyors. The aspirants willing to apply for the recruitment process can go to the official website of CG Vyapam Gramin Krishi Vistar Adhikari RAEO recruitment 2017 website CG Vyapam.choice.gov.in and submit the application form before the last date I.e 20-03-2017 to escape from the last minute problems and to avoid any hassles.The recruitment process has begun from first week of march and will be available till the mid of march .The candidates are advised to carefully read the recruitment notification published by chhattisgarsh professional recruitment b oard’s official website to get the appropriate information about the recruitment process,number of vacancies, selection procedure, pay scale, educational qualifications etc. Candidates must download the official notification of CG Vyapam Gramin Krishi Vistar Adhikari RAEO recruitment 2017 from the official site:cgvyapam.choice.gov.in. The online registration for RAEO is going on the interested candidates who want to grab the opportunity without waiting for the last date to apply as mid march is the last and registration process has begun. The candidates are advised to apply and get the copy of the application form and to keep it safely f future reference.The CG Vyapam Gramin Krishi Vistar Adhikari recruitment and AERO and surveyors recruitment details have been provided in this article for further queries or any information regarding the above mentioned positions the candidates are required to visit www.cgvyapam.choice.gov.in to clear all the doubts regarding the vacancies. Chhattisgarh Government has finally again released recruitment notification regarding posts of Patwari Bharti and Revenue inspector. there is total of 1175 vacancies available. CG Vyapam Krishi Vistar Adhikari Recruitment 2017 and Chhattisgarh Vyapam RAEO Recruitment Vacancies 2017 respectively. Millions of candidates are trying to apply and waiting online to check official eligibility criteria. well, here we are going to discuss complete details on Syllabus, Age Limit, Eligibility, Educational Qualification Required and other such details. Chhattisgarh 90 Revenue Inspector Recruitment notification just aired on the official website at cgvyapam.choice.gov.in. Candidates who all wants apply must apply through this portal. here is a complete process how to apply for selected job post. Log on to official website here at cgvyapam.choice.gov.in. Click on CG Vyapam Patwari Notification link. ON Screen CGVyapam Revenue Inspector notification will be displayed, read it carefully. If satisfied to all the mentioned requirements. Select the post of Patwari Bharti or Revenue Inspector to need to apply. Fill the necessary details without any errors. Download it & Take a hard copy for future. We are not yet sure whether there is an online form filling or offline mode of application. if there is an online system to apply, candidates can follow up above given procedure. But, If not candidates must download the official application form and then fill it up carefully. pay fees through bank draft or post office and then post it to prescribed address. Computer Related General Knowledge 20 ques. 20 Marks. Hindi Language with Grammar 10 ques. 10 Marks. General English with Grammar 10 ques. 10 Marks. Mathematics 30 ques. 30 Marks. General Mental Ability 15 ques. 15 Marks. General Knowledge 35 ques. 35 Marks. Current Affairs, Sports, India and International 15 ques. 15 Marks. 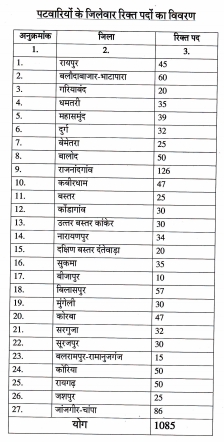 General Knowledge regarding Chhattisgarh 15 ques. 15 Marks. Total Ques/ Marks. 150 Questions. 150 Maximum Marks. Chattisgarh Government has announced its recruitment notification for various government examinations. candidates who all wish to appear in these exams are requested to check below the details and apply for said examination here below. CG Vyapam is eminently known as Chhattisgarh Professional Examination Board. It is an official board that recruits the candidates those is eligible for the vacant positions in various departments under the control of the government. The primary aim of CG Vyapam is to conduct the entrance examination that provides admissions in the Professional and educational institutions. Krishi Vistar Adhikari (RAEO). 1st March 2017. 31st March 2017. Apply Here.